Italian composer (1792-1868). 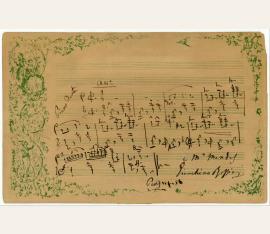 Autograph musical manuscript signed and signed portrait. N. p. Oblong octavo manuscript on laid paper, ruled with staves throughout. 55 pp. on 30 ff. 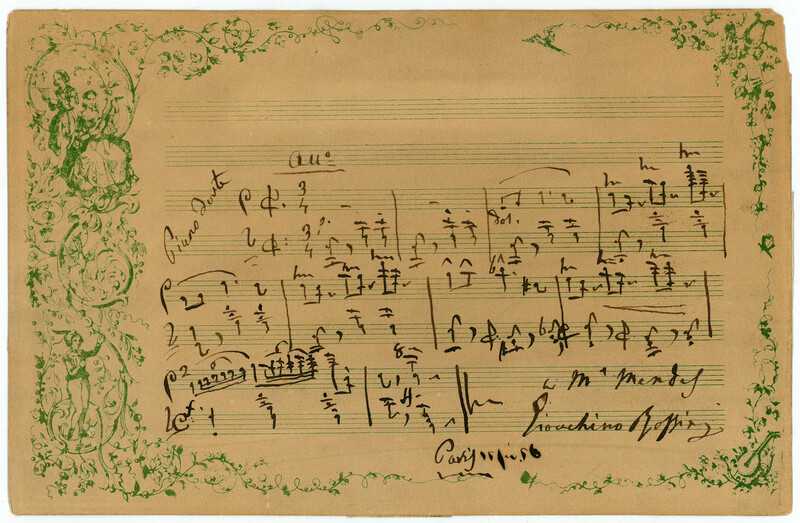 Fifty-five leaves, signed by Rossini on the first page, containing the full scores of three compositions (sextets and septets): "La Notte", "La Preghiera", and "La Caccia". - Bound with pale green silk ribbons, with old stamps on otherwise blank front cover sheet, and a lengthy note of authenticity by a Belgian autograph expert, dated 1904, with his stamp; housed in a custom-made silk-lined tooled and gilt-leather box, mounted with an inscribed carte-de-visite of the Maestro, dated 1861; manuscript with some finger smudges, carte-de-visite with some surface damage, the box slightly warped, surface wear; the manuscript: 5 x 7½ in (127:190 mm). Italian composer (1792-1868). Autograph musical manuscript signed. Paris. Oblong 4to. 1 page. A delightful musical autograph in C major (with a brief D minor development) written a year after the composer settled in his Paris apartment on rue de la Chaussée-d'Antin. The dedicatee, 'M. 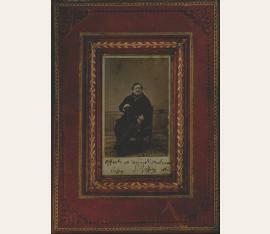 Mendes', may possibly be Mario do Céu da Silva Mendes, daughter of the eminent Portugese writer Joao da Silva Mendes. She would have been nine at the time, but was an able pianist even then and later became a notable performer and teacher; the image of the famous composer jotting down a musical flourish for a young admirer is a difficult one to resist. - Edges slightly frayed, and small traces of mounting. 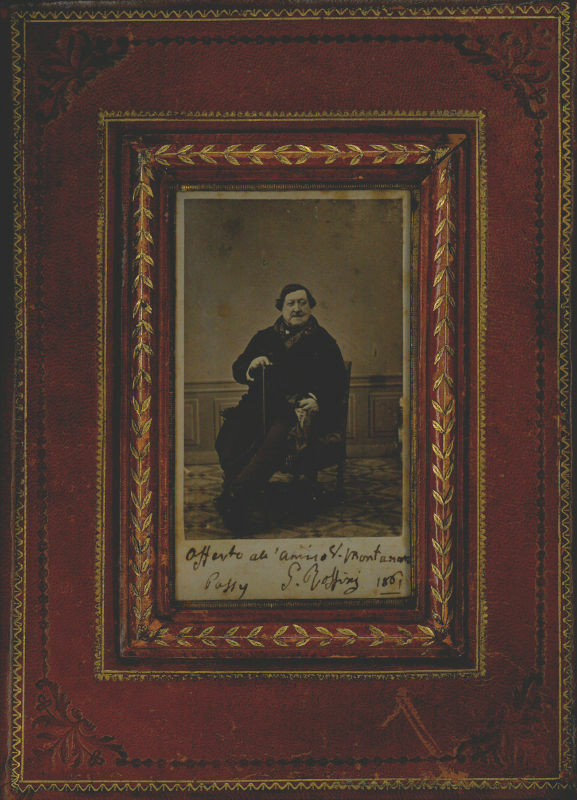 Gioacchino Rossini (1792–1868), Komponist. E. Brief mit U. („G. Rossini”). Paris, 14. Mai 1861. 1 S. auf Doppelblatt. Kl.-4°. Mit e. Adresse (Faltbrief). 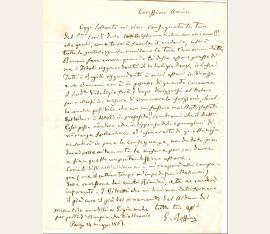 – An den Advokaten Leopoldo Pini in Florenz darüber, daß ein Bonani sich irre, wenn er behauptete, die Titel der Fengi-Rente [?] seien bei ihm. Er habe alle seine Geschäftsdokumente in Florenz gelassen, und wenn Bonani selbst nicht im Besitz der Papiere für die Rente sei, müsse er sich selbst zum Notar begeben, um die Registrierung erneut vorzunehmen: „Io lasciai tutti i Rogiti riguardanti i miei affari in Firenze e se Bonani non è in possesso di quanto concerne il [?] vitalizio farà l´uopo diriggersi al Notaro per mettersi in misura di rinnovare le spartizioni.“ Möglicherweise habe er besagte Titel auch nie vom Notar zugesandt bekommen. Doktor Cosio [oder: Cosci] müsse sich wohl um die unumgängliche Transaktion bemühen, die Hypothek zu erneuern, was ihn, Pini, von dem ganzen Ärger befreien würde. Er selbst zweifle nicht daran, daß er diese äußerst wichtige Angelegenheit zu einem guten Ende bringen würde und werde die Konsequenzen akzeptieren: „Sembrami che il Dott. Cosio [Cosci?] possa adempire alle indispensabili operazioni di rinnovanza ipotecharia ed esonerarti di quella noja. Ne subirò in pace le conseguenze, non dubito prenderà sollecitamente le misure per condurre a fine questo importantissimo affare“. – Beiliegend ein koloriertes Stahlstichportrait. Gioacchino Rossini (1792–1868), Komponist. E. Brief mit U. Florenz, 5. August 1852. 2½ SS. auf Doppelblatt. Gr.-4°. Mit e. Adresse (Faltbrief). – An einen „Baron Frenc“, d. i. wohl Martin Joseph ffrench, 5th Baron ffrench (1813–1893), ein Rechtsanwalt und Resident Magistrate in London, mit der Mitteilung, daß er sich im August und September („i piu tristi mesi dell’anno“) des Jahres auf dem Land in Pietra aufhalten und dort die Villa eines „Milord Normandy“ bewohnen werde, die er überdies sehr interessiert sei zu erwerben. Er ersucht nun den mit dem Besitzer befreundeten Baron ffrench sich bei diesem nach dessen Preisvorstellungen zu erkundigen und verweist zudem auf die aktuell gefallenen Immobilienpreise und auch auf die entlegene Lage der Villa: „[...] suposto vero che Milord voglio alienare il sue dopesto non ignoreà che stante le cose politiche gl’imobili sono decaduti del cinquanta per cento del prezzo originario, sarà pure a cognizione del Nobil Uomo che I Fabbricate Imobilie, Terreni sono in una regionale decadenza [...] Ho fatto a lei Sig Barone tutta questa cicalata perche volendo proteggermi in una tratta con Milord, dopo avere armi per difendermi [...]“. – Etwas knittrig und stellenweise mit Tintenfraß; Bl. 2 mit kleinem Ausriß durch Siegelbruch (keine Textberührung; das mit „GR“ monogrammierte Siegel größtenteils erhalten); Mittelfalz etwas eingerissen; die Adresse von zeitgen. 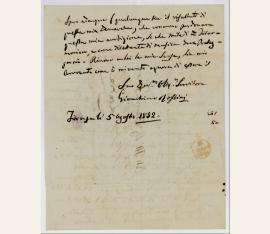 Hand mit einem Zusatz versehen; mit Stempel des „Archivio Farina-Cini“. Eigenh. musikalisches Albumblatt mit U. („G. Rossini“). 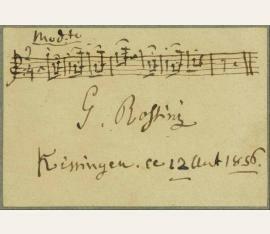 Rossini pens five bars of unidentified music. He also adds the place and date, Kissingen, August 12, 1856, along the bottom. Affixed to a 5.75 x 4.75 mount. In fine condition. Rossini is quite uncommon in musical quotes.